Following the maiden flight of AirAsia’s Davao-Kuala Lumpur–Davao route in December 2017, local officials and executives of the multi-awarded low-cost airline came to Davao on Thursday, February 1 to officiate the new route. AirAsia now flies direct from Davao City to Kuala Lumpur, Malaysia 4x weekly. This newly opened international route is one of the important milestones in developing connectivity in the ASEAN region as this will not only bring a lot of opportunities to local travellers but also will serve as development catalyst to the growing economy not only of Davao City but the whole of Mindanao as well. (From third to right) Arturo Milan, President, Davao City Chamber of Commerce and Industry Inc.; Ambassador Charles Jose, Ambassador of the Philippines to Malaysia; Aireen Omar, AirAsia Deputy Group CEO – Digital, Transformation, Corporate Services; Sara Duterte-Carpio, Davao City Mayor; Datu Abul Khayr Alonto, Chairman of the Mindanao Development Authority; Nora K. Terrado, Undersecretary, Trade and Investments Promotion Group (TIPG); Riad Asmat, CEO of AirAsia Malaysia; Honorable Mohd Jafri Mohd Sharif, Consul of Malaysia in Davao pose for photo opportunity shortly after the officiating ceremony of AirAsia's Davao-Kuala Lumpur route at Marco Polo Davao on February 1, 2018. “AirAsia group is excited about our first international route to Davao. 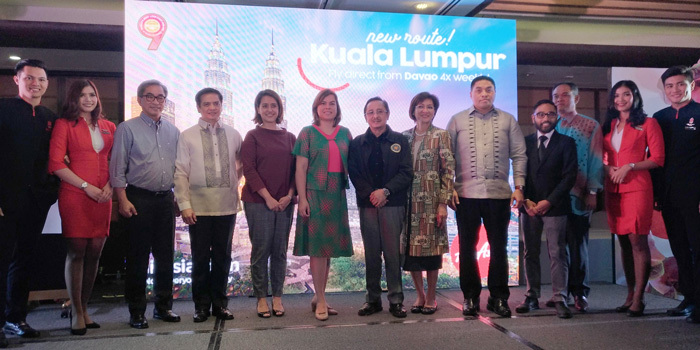 Not only it connects Davao to Malaysia but we are also bringing Davao closer to all of our group network and this is in ASEAN, Northeast Asia, South Asia, Australasia, the Middle East and the US.” Said Aireen Omar, AirAsia’s Deputy Group CEO – Digital, Transformation, Corporate Services. “We are committed to growing tourism beyond the most famous tourism hotspots and it is our mission to help put Davao on the map of must visit destination in ASEAN. By improving connectivity in these cities we help to spread development beyond the capitals. We hope that our international flight to Mindanao bring in economic contribution in terms of tourism receipts, creation of jobs and opportunities for SMEs and marginalized communities. Also to bring awareness and commitment to environmental protection and sustainable tourism practices.” Ms. Omar further added. AirAsia also lauded the efforts of the Philippine government to bring about awareness and availability of halal food products and services. This effort is to ensure that vital needs of other ASEAN tourists communities around this region are met through this connectivity. In line with this, Japan for instance has successfully implemented halal compliant tourism programs. Seeing the need to keep up, the government through its relentless efforts is expected to follow suit. Mindanao has a lot to offer to draw more tourists from across the ASEAN region with its 634 million strong people. Through this development it is expected that Davao will not only flourish as a major conduit when it comes to growth area in the international market but also as a center for financial, tourism and education in Mindanao. In her speech at the officiating ceremony, Davao City Mayor Sara Duterte revealed that this new route will bring in a window of various opportunities to many sectors not only in Davao City but also in the whole of Mindanao island. “This route is an expression of your commitment (AirAsia) to ASEAN connectivity and the growth of ASEAN member states is truly a welcome development for the Philippines and Davao City. Air connectivity is a major component in strengthening tourism, business and foreign relations as it creates more people to people linkages and as part of ASEAN community we are excited for this new route not only that it will bring our two cities closer and also link Mindanao and its industries to our Malaysian neighbours and vice versa.”said Davao City Mayor Sara Duterte. In 2017, Davao City has breached 2M tourist arrivals and will press more efforts to better the number this year. The city government also commits that every tourists visiting Davao City will have a pleasant and enjoyable stay as possible by covering tourism essentials like; accommodation, dining options, peace and order situation, traffic and transportation and etc. And to celebrate this occasion AirAsia offers one-way PHP1599 all-in-fares (inclusive of tax). Book from now until February 18, 2018 to travel from now until July 31, 2018. Visit www.airasia.com for booking.